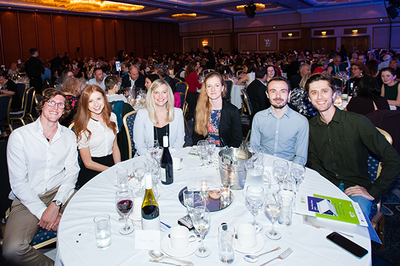 Congratulations to our six 3MT finalists who gave excellent presentations and who provided the participants at the Vitae annual conference dinner an exciting evening sponsored by Taylor & Francis. Congratulations go to Thomas Fudge who won £3K grant to spend on public engagement activity (sponsored by RCUK) and to Euan Doidge who has the opportunity to present at the famous Faraday Lecture Theatre at the Royal Institution (sponsored by Speakezee). Decentralised Sanitation for developing communities with energy and nutrient recovery. WEEE are Golden: metal recovery by solvent extraction. Does "an apple a day" keep the doctor away? Oranges versus crude oil: Can we reduce the use of crude oil by using plants? Helping to treat Alzheimer's disease by detecting 'sticky' memories.